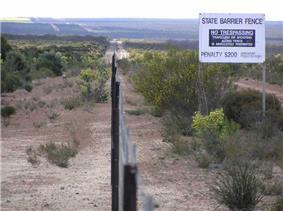 A rabbit-proof fence enforces a barrier to protect agriculture areas in Western Australia. Rabbits are an invasive species in Australia. Environmental issues in Australia describes a number of environmental issues which affect the environment of Australia. There are a range of such issues, some of them relating to conservation in Australia while others, for example the deteriorating state of Murray-Darling Basin, have a direct and serious effect on human land use and the economy. Climate change is now a major political talking point in Australia in the last two decades. Persistent drought and resulting water restrictions during the first decade of the twenty-first century are an example of natural events attributed by the mainstream media to climate change. Australia ranks within the top ten countries globally with respect to greenhouse gas emissions per capita. The current federal and state governments have all publicly stated their belief that climate change is being caused by anthropogenic greenhouse gas emissions. Vocal minority groups within the population campaign against mining and coal-fired power stations in Australia, and such demonstrations are widely reported by the mainstream media. Similarly, vocal minority groups concurrently oppose wind energy schemes, despite being 'carbon neutral', on the grounds of local visual and noise impact and concern for the currently high cost and low reliability of wind energy. Despite the publication of the Garnaut report and the Green Paper on the proposed Carbon Pollution Reduction Scheme, public belief in anthropogenic climate change has noticeably eroded following the leaking of e-mails from the University of East Anglia's Climate Research Unit. There is claimed to be a net benefit to Australia in stabilising greenhouse gases in the atmosphere at 450ppm CO2 eq in line with the prevailing political stance. Public disagreement with this opinion is generally dismissed as expression of vested interests, for example from the coal industry. Australia is a major exporter and consumer of coal, the combustion of which liberates CO2. Consequently, in 2003 Australia was the eighth highest emitter of CO2 gases per capita in the world liberating 16.5 tonnes per capita. Australia is claimed to be one of the countries most at risk from climate change according to the Stern report. Most of Australia's demand for electricity depends upon coal-fired thermal generation, owing to the plentiful indigenous coal supply, limited potential for hydro-electric generation and political unwillingness to exploit indigenous uranium resources (although Australia accounted for the world's second highest production of uranium in 2005 ) to fuel a 'carbon neutral' domestic nuclear energy program. Conservation in Australia is an issue of state and federal policy. Australia is one of the most biologically diverse countries in the world, with a large portion of species endemic to Australia. Preserving this wealth of biodiversity is important for future generations. A key conservation issue is the preservation of biodiversity, especially by protecting the remaining rainforests. The destruction of habitat by human activities, including land clearing, remains the major cause of biodiversity loss in Australia. The importance of the Australian rainforests to the conservation movement is very high. Australia is the only western country to have large areas of rainforest intact. Forests provide timber, drugs, and food and should be managed to maximize the possible uses. Currently, there are a number of environmental movements and campaigners advocating for action on saving the environment, one such campaign is the Big Switch and I Love Earth. Land management issues including clearance of native vegetation, reafforestation of once-cleared areas, control of exotic weeds and pests, expansion of dryland salinity, and changed fire regimes. Intensification of resource use in sectors such as forestry, fisheries, and agriculture are widely reported to contribute to biodiversity loss in Australia. Coastal and marine environments also have reduced biodiversity from reduced water quality caused by pollution and sediments arising from human settlements and agriculture. In central New South Wales where there are large plains of grassland, problems have risen from—unusual to say—lack of land clearing. The Daintree Rainforest, a tropical rainforest near Daintree, Queensland covering around 1200 square kilometres, is threatened by logging, development, mining and the effects of the high tourist numbers. 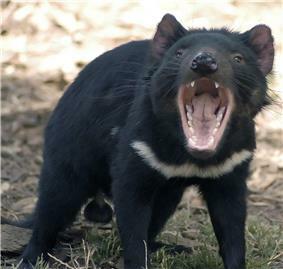 The Tasmanian Devil, officially listed as an endangered species in 2008. Over a hundred species of fauna are currently under serious threat of extinction. The plight of some of these species receives more attention than others and recently the focus of many conservation organisations has been the critically endangered Northern Hairy-nosed Wombat, the endangered Tasmanian Devil, Northern Tiger Quoll, South Eastern Red-tailed Black Cockatoo, Southern Cassowary, Tasmanian Wedge-tailed Eagle, Leadbeater's Possum and Southern Corroboree frog. Australia has a poor record of conservation of native fauna. The extinction of Australian megafauna is attributed to the arrival of humans and since European settlement, 23 birds, 4 frogs, and 27 mammal species are also known to have become extinct. One of the notable issues with marine conservation in Australia is the protection of the Great Barrier Reef. 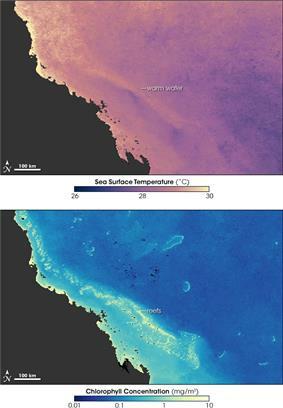 The Great Barrier Reef's environmental pressures include water quality from runoff, climate change and mass coral bleaching, cyclic outbreaks of the crown-of-thorns starfish, overfishing, and shipping accidents. Whaling in Australia took place from colonisation in 1788. In 1979 Australia terminated whaling and committed to whale protection. The main varieties hunted were Humpback, Blue, Right and Sperm Whales. While there have been no oil spill environmental disasters of the scale of the Exxon Valdez in the country, Australia has a large oil industry and there have been several large oil spills . Spills remain a serious threat to the marine environment and Australian coastline. The largest spill to date was the Kirki tanker in 1991 which dropped 17,280 tonnes of oil off the coast of Western Australia. In March 2009, the 2009 southeast Queensland oil spill occurred, where 200,000 litres were spilled from the MV Pacific Adventurer spilling more than 250 tonnes of oil, 30 tonnes of fuel and other toxic chemicals on Brisbane's suburban beaches. Premier Anna Bligh described the spill as "worst environmental disaster Queensland has ever seen". A serious issue to the Australian marine environment is the dumping of rubbish from ships. There have been a number of cases, particularly involving the navy of Australian and other countries polluting Australian waters including the dumping of chemical warfare agents. Recently documented cases include the aircraft carrier USS Ronald Reagan in 2006 which was found to be dumping rubbish off the shores of Moreton Island. In Victoria, a large number of toxic drums containing 1,2-Dichlorobenzene xylenol, a substance very toxic to aquatic creatures washed up on beaches during May 2009 presumably fallen off a passing container ship. Australia's geographical isolation has resulted in the evolution of many delicate ecological relationships that are sensitive to foreign invaders and in many instances provided no natural predators for many of the species subsequently introduced. Introduced plants that have caused widespread problems are lantana and the prickly pear bush. The introduction and spread of animals such as the cane toad or rabbit can disrupt the existing balances between populations and develop into environmental problems. The introduction of cattle into Australia and to a lesser extent the dingo, are other examples of species that have changed the landscape. In some cases the introduction of new species can lead to plagues and the extinction of endemic species. The introduced species red fox has single-handedly caused the extinction of several species. Tasmania takes the threat of red fox introduction so seriously that it has a government sponsored taskforce to prevent fox populations from taking hold on the island. In the prehistory of Australia the indigenous Australians used fire-stick farming which was an early form of land clearing which caused long term changes to the ecology. With European colonisation land clearing continued on a larger scale for agriculture - particularly for cattle, cotton and wheat production. Since European settlement a total of 13% of native vegetation cover has been lost. The extinction of 20 different mammals, 9 bird and 97 plant species have been partially attributed to land clearing. Land clearing is a major source of Australia’s greenhouse gas emissions, and contributed to approximately 12 percent of Australia’s total emissions in 1998. The clearing of native vegetation is controlled by Federal laws (indirectly), State law and local planning instruments. The precise details of regulation of vegetation clearing differ according to the location where clearing is proposed. Australia is one of the most urbanized countries in the world. 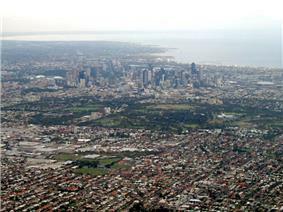 Many Australian cities have large urban footprints and are characterised by an unsustainable low density urban sprawl. This places demand on infrastructure and services which contributes to the problems of land clearing, pollution, transport related emissions, energy consumption, invasive species, automobile dependency and urban heat islands. The urban sprawl continues to increase at a rapid rate in most Australian cities, particularly the state capital cities, all of which (with the exception of Hobart) are metropoleis. In some centres, such as Sydney and Greater Western Sydney, Greater Melbourne and South East Queensland large metropolitan conurbations threaten to extend for hundreds of kilometres and based on current population growth rates are expected to become megacities in the 21st century. Most Australian cities population growth is a result of migration in contrast to the Birth rate and fertility rate in Australia, which is contributing to the ongoing trend of urbanisation. In recent years, some cities have implemented transit-oriented development strategies to curb the urban sprawl. Notable examples include Melbourne 2030, South East Queensland Regional Plan and the Sydney Metropolitan Strategy. There are also population decentralisation programs at state and federal levels aimed at shifting populations out of the major centres and stemming the drivers to rapid urbanisation. Albury-Wodonga was part of the federal government's program of decentralisation begun in the 1970s, which has at times had relocation policies for immigration. The Victorian government has run a decentralisation program since the 1960s, having had a ministerial position appointed and ongoing promotional and investment programs for stimulating growth in Regional Victoria. However policy has swung over the decades, primarily due to local development priorities and agendas and a lack of federal co-ordination to the problem. The Murray-Darling Basin is under threat due to irrigation in Australia, causing high levels of salinity which affect agriculture and biodiversity in New South Wales, Victoria and South Australia. These rivers are also affected by pesticide run-off and drought. Rivers and creeks in urban areas also face environmental issues, particularly pollution. Water use is a major sustainability issue in Australia. During times of drought Water restrictions in Australia apply to conserve water. Climate change may intensify drought in Australia putting pressure on water resources and leading to alternative water sources including construction of Water tanks, dams, Water transportation and desalination plants many of which affect water catchments and put increasing pressure on the environment. Soil salinity affects 50,000 km² of Australia and is predominantly due to land clearance. Sustainable waste management is significant problem in Australia, and serious issues include large quantities of e-waste and toxic waste going into landfill. Australia does not have restrictions on the dumping of toxic materials that are common in other countries, such as dumping Cathode Ray Tubes which leech heavy metals into water catchments. Due to the lack of sufficient sites for toxic waste disposal large quantities of toxic waste are trucked between states to remote dumping grounds or exported overseas in ships. At least 150 leaks, spills and licence breaches have occurred at the Ranger uranium mine between 1981 and 2009. The following is a list of controversial development projects due to concerns of environmental effects. This list includes projects required to submit an Environmental Effects Statement. British nuclear tests at Maralinga Nuclear testing South Australia 1955–1963 Massive radioactive contamination. Continual cleanup operations. Long-term health effects on the traditional Aboriginal owners of the land and former personnel. Uranium mining in Australia Uranium mining 1980- Possible contamination of land with radioactive mine tailings. Ranger mine contained within Kakadu National Park. Franklin Dam Damming Tasmania 1983 Damming of forested area, watercourse damage, reduced water flow. Catalyst for the foundation of the Australian Greens. Yarra Valley Logging Victoria 1993- Deforestation. Threatening of a major water catchment. Threatening the endangered Leadbeater's Possum. Tiwi Islands Deforestation and woodchipping Northern Territory 2001 Deforestation approved by the Howard government. Operators significantly breached environmental laws resulting in excessive irreparable land clearing. Nowingi toxic waste proposal Toxic waste Victoria 2004 Toxic waste disposal plant. Threat to surrounding settlements, Murray River and environment. Bell Bay Pulp Mill Logging Tasmania (proposed) 2006 Deforestation. Threatening of old growth forests in the Tamar Valley. Claims effluent could harm of Bass Strait marine life. Styx Valley Logging and woodchipping Tasmania 2006 Deforestation. Destruction of old growth forests. Wonthaggi desalination plant Desalination Victoria 2007 Uneconomic. Pollution of the Bass Coast. Accusations of government/private entity corruption. Lack of consultation with community. No justification for perceived requirement. Insufficient initial assessment. Insufficient EES. Port Phillip Channel Deepening Project Dredging Victoria 2008- Dredging in heavy metal-laiden shipping ports posed contamination concerns. Destruction of marine environments. Catalyst for the foundation of the Blue Wedges community group. ^ Australian Environmental Foundation press release "...fewer than half of Australians now support the introduction of an Emission Trading Scheme." ^ Australian Chamber Of Commerce And Industry, "Nuclear Power - An Option For Australia"
^ Naidoo, Meryl (22 May 2009). "Tasmanian devils listed as endangered on threatened species list". Herald Sun. ^ Suter, Keith D. (October 1982). "Australia's new whaling policy : Formulation and implementation". Marine Policy 6 (4): 287–302. ^ Robyn Ironside, Anna Caldwell and Brian Williams (13 March 2009). "Pacific Adventurer oil spill a disaster says Anna Bligh". The Courier Mail. ^ "US carrier exempt from dumping law". Sunshine Coast Daily (Sunshine Coast Newspaper Company). 1 February 2006. Retrieved 22 March 2012. ^ Johnston, Chris (21 May 2009). "Mass decontamination as toxic drums continue to wash ashore". The Age (Melbourne). ^ "Sydney needs a future plan to be sustainable: mayor". Reuters. 6 June 2007. ^ Plan now for the future of South-East Queensland - January 2005. Wildlife Preservation Society of Queensland. Retrieved on 22 March 2012. ^ Rachel Kleinman (3 May 2006). "Lib planning policy under attack as groups support 2030". The Age (The Age Company). Retrieved 22 March 2012. ^ Mick Bunworth (25 January 2005). 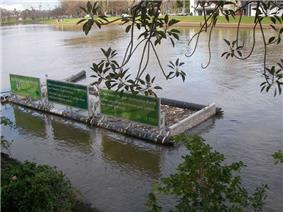 Yarra pollution poses serious health risk. 7.30 Report transcript. Australian Broadcasting Corporation. ^ "Tracing a toxic river to its source". The Age (Melbourne). 24 August 2005. ^ "Arsenic leaked into river". The Age (Melbourne). 22 August 2005. ^ (22 June 2007). River condition in the Murray-Darling Basin 2001. National Water Commission. Retrieved on 22 MArch 2012. ^ Tony Moore (22 October 2008). "Brisbane's rivers, creeks in ailing health: report". ^ Emma Pollard (17 December 2009). "Defence Dept to fix Amberley base creek pollution". ^ Nikole Jacobi and Francis Tapim (8 September 2009). Exhaustive investigation' into Amberley creek contamination"'". ABC News Online. ^ South East Queensland Regional Strategic Group (2000). Strategic Guide to Natural Resource Management in South East Queensland. p. 56. ^ "Oxley creek bonus". South West News. 28 October 2008. p. 2. ^ The Bulimba Creek Catchment Pollution Page. The Rivermouth Action Group. Retrieved on 22 March 2012. ^ Owen, Michael (2006-09-16). "Taskforce to look at ailing Torrens". The Advertiser, Adelaide (News Limited). ^ Egan, Carmel (27 July 2008). "Clampdown on toxic waste". The Age (Melbourne). ^ Murdoch, Lindsay (13 March 2009). "Polluted water leaking into Kakadu from uranium mine". The Age (Melbourne). ^ Peter Garrett (16 October 2008). "Tough measures placed on Tiwi plantations". Joint media release. Department of Sustainability, Environment, Water, Population and Communities. Retrieved 22 March 2012.